Karen Lombardy and guest speaker Jeanne Basso explained the historyof the many DAR pins, medals, ribbons and other insignia. Essay awards for middle school students and the details of insignia protocol were the main events at the February 18th meeting of the Marco Island Chapter of the Daughters of the American Revolution at the Hideaway Beach Club. 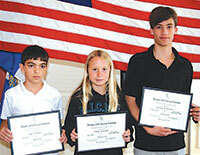 Three Marco Island Charter Middle School students read their winning submissions to the DAR American History Essay Contest. Zachary DeSerranno, 8th grade, Hailey Cartwright, 7th grade, and Ryan Palumbo, 6th grade, wrote imaginative narratives of colonial families trying to decide what to do about the crushing British stamp tax of 1765. Their assignment was to write from a young person’s point of view about colonials faced with the burdensome tax on all paper products, including legal documents, magazines, newspapers, even playing cards. mob violence to intimidate the tax collectors. A year later, in 1766, the British Parliament repealed the Stamp Act, but that “taxation without representation” issue helped to fuel the Revolutionary War ten years later. The three winning students each received a DAR certificate and a medal. Jeanne Basso visited the chapter from the Barefoot Beach DAR Chapter. She has held more than a dozen Florida and national DAR positions. Her presentation detailed the history, meaning and proper display of DAR medals, pins and other insignia. There are many rules about when, where and how such insignia can be worn, many of which were a surprise to the members. 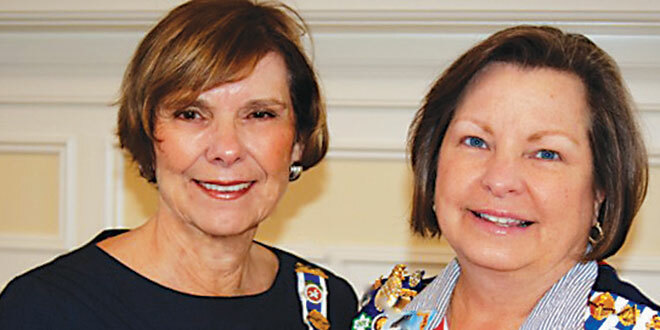 The Marco Island Chapter of the DAR has 53 members and 18 associate members from other chapters. Monthly luncheon meetings are at 10:30 AM on the third Thursday of each month. Potential members and visitors from other chapters are welcome. For more information, please contact Karen Lombardi at 239-394-0028.